Is there a “conservative” attitude toward the new(ish) Common Core State Standards? Though as we’ve noted, conservatives disagree, the session at the on-going Conservative Political Action Conference about the standards sounded like a bash-fest. In the pages of The American Conservative, Gracy Olmstead offered a fly-on-the-wall report. Conservative luminaries such as Phyllis Schlafly, Lindsey Burke of the Heritage Foundation, Robert Enlow of the Friedman Foundation, and Jim Stergios of the Pioneer Institute took the CCSS to task for centralizing education. Such centralization, Schlafly warned, does not occur in an ideological vacuum. With more control from Washington comes more “liberal propaganda,” Schlafly insisted, as she has done before. Enlow warned that centralization introduced yet another level of government control, blocking parents from their rightful control of their children’s education. And Stergios insisted that the CCSS claim to be “state-led” was laughable. Did this CPAC panel define the only “conservative” position on the Common Core? As Stergios noted, many conservatives like the core. He thought that opinion was “ludicrous.” But correspondent Gracy Olmstead disagreed. She noted that the standards still attracted fans and foes from all political sides. Among some conservative intellectuals and pundits, nothing says “government overreach” like public education spending. This morning in the pages of National Review Online, Michelle Malkin spits some bile at President Obama’s plans to invest in universal early-childhood education. As have other conservatives such as Lindsey Burke and Rachel Sheffield of the Heritage Foundation, Malkin denounces federally sponsored pre-kindergarten schooling in the harshest terms. Malkin argues that the vaunted promises of universal pre-k don’t stand up to intelligent scrutiny. As have other fed-skeptics, Malkin seems to mix up a few federal reports. She refers second-hand to a journalist’s citation of a 2010 study of pre-k’s long-term effectiveness. If she really wanted to bash federally sponsored universal pre-k, though, she would have been wiser to cite the Department of Health and Human Services 2012 follow-up to that study. The 2010 study suggested that Head Start programs had a significant positive impact on children. The 2012 follow-up, in contrast, implied that those positive effects dissipated by third grade (roughly age 7/8). The numbers seem pretty clear: universal pre-k is not the simple social and educational panacea that some progressives had hoped for. Perhaps this moral dilemma is the reason why Malkin is not overly concerned with the social-science exactitude of her sources. Her argument goes like this: federally sponsored pre-k doesn’t work. And even if it did, it would still lead our society in morally monstrous directions. Do Conservatives Want the Government to Tell Americans What to Do? That’s the question education pundits from the Heritage Foundation have been asking lately. To a non-conservative outsider like me, this question raises key questions about the goals of conservative education policy. It seems as if Heritage Foundation writers want both a less intrusive government and a more intrusive government. Don’t get me wrong. I understand that there are different sorts of conservatives, all of whom may have very different visions of the good society, good education, and the proper role of government. I’ve read the work of historians such as George Nash who have chronicled the post-World War II tensions between libertarians and social conservatives. But in this case, it seems as if one conservative organization—a small-government conservative organization—is calling for a big-government solution to education dilemmas. Here is the recent confounding case: In light of President Obama’s recent call for universal, government-funded preschool, Heritage writers have renewed their push for a different vision. Lindsey Burke and Rachel Sheffield of the Heritage Foundation insist that government-funded schooling is not the effective or ethical way to improve school achievement. The obvious answer, Burke and Sheffield write, is to improve families. They cite research to prove that programs such as Head Start have not been effective. One conclusion that could be drawn from this is that the government needs to encourage families to stay together. The public-policy goal would be obvious: if intact families improve school performance, then the government has a compelling interest in promoting stable families. Burke and Sheffield avoid that conclusion. Instead, they suggest that government should eliminate or reform Head Start, stop mandating government preschool, and reform existing preschool programs before expanding into new ones. Rector also suggests concrete policy suggestions to strengthen families, such as increasing the tax benefits to married couples with children. I honestly don’t mean to be snarky when I ask this next question; I am truly confused. Do small-government conservatives such as Heritage’s Robert Rector really want the government to tell people how to regulate their intimate lives? Heritage’s Derrick Morgan offered what seems to me an awkward patch of these conflicting sentiments a few months ago. Small government was the answer, Morgan wrote. But smaller government must also promote “traditional values” as part of its goal to shrink its own purview. When it comes to education policy, this just doesn’t add up. Small-government goals of privatized education, smaller government-funded programs, and fewer government education standards seem consistent. Even if I don’t agree with them, I can see their logic. But I don’t understand how Heritage’s conservative thinkers connect these goals with a simultaneous government intrusion into the most private, intimate decisions Americans make. Hostile critics, I think, would assume that Heritage wants to impose government mandates on poor and powerless Americans, while allowing richer and more powerful citizens to enjoy freedom from government interference. That seems a little simplistic, especially for the sophisticated thinkers preferred by the Heritage Foundation. But is it true? Does the Heritage Foundation suffer from—at best—confused ideology about education? Or, at worst, is Heritage cynically promoting intrusive government for the poor, and small government for the rich? Here I think Burke and Sheffield need to be more careful. The reference they cite was actually to a 2010 study, one that reports significant positive effects of 3- and 4-year-old Head Start problems. But from the text of their article, I gather the authors meant to reference a more recent 2012 follow-up, in which few long-term differences were found between children who attended Head Start and those who did not. What do conservatives think about the emerging Common Core State Standards? As with any question, ask a hundred conservatives and you’ll likely get a hundred different answers. However, some distinct themes have emerged in recent months. First, many conservative politicians and activists object to the Common Core’s implications for the creeping expansion of government. Some insist that the standards add another layer of inaccessible, distant, controlling, expensive central control. Second, conservatives object that the new national standards chip away at parental control of children’s education. With greater central control, parents and responsive local governments will lose that much more ability to control directly what goes in their local public schools. Both of these are storied conservative protests against the trends in public education. Conservatives are not the only ones to dispute these claims. Progressive critics (see one example here) often lament the new standards’ failure to consider adequately individual student situations. Some progressives call the standards a greedy corporate power grab. Others lament the goal of squeezing all young minds into a procrustean bed of regurgitative multiple-choice testing instead of pursuing the more difficult goal of authentic learning for real students. Alfie Kohn, for instance, insisted that national standards would “squeeze the life out of classrooms” by mandating one-size-fits-all education, dictated by self-seeking corporate interests. The Heritage Foundation’s Rachel Sheffield praised state lawmakers who pushed to exit the CCSS. In Indiana, for instance, conservative state lawmakers have proposed a bill to put the CCSS on hold. One of the requirements of Indiana’s Senate Bill 193, for instance, will be to include parent members on the standards committee. Another will be to allow any parent to challenge their children’s standard-based high-stakes test results. These themes—federal overreach and parental control—have long been central to conservative educational activism. 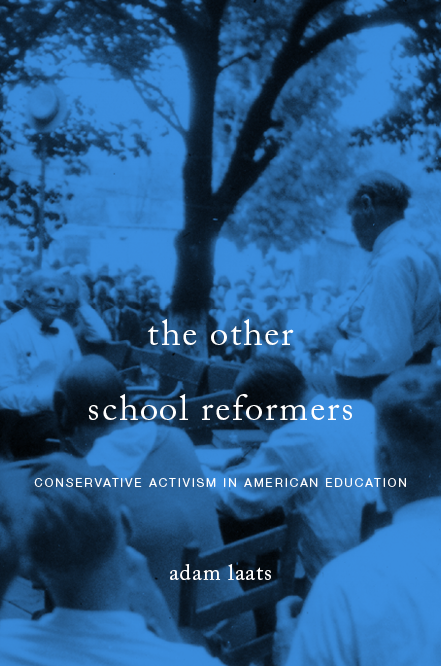 As we’ve noted, agitation against federal intrusion into the local politics of education has been an important element of conservative educational activism since at least the 1940s. Though it might come as a surprise to some, before the 1940s many conservatives endorsed increased centralization of education policy, as Douglas Slawson has noted in his excellent book The Department of Education Battle, 1918-1932. These conservative concerns spanned the country and the decades. As historian Ron Formisano noted in his landmark 1991 history of Boston disputes over forced busing, parents insisted on their fundamental rights to determine their own children’s educational careers. As anti-busing leader Louise Hicks fumed, “If under a court order a child can be forcibly taken from his parents into unfamiliar, often hostile neighborhoods, then we shall have opened a pandora’s box of new, unlimited government powers” (pg. 192). Similarly, President Reagan insisted in 1983, “I believe that parents, not Government, have the primary responsibility for the education of their children. Parental authority is not a right conveyed by the state; rather, parents delegate to their elected school board representatives and State legislators the responsibility for their children’s schooling.” (Source: Catherine Lugg, For God and Country, pg. 136). Across the spectrum of conservative belief and activism, we hear similar echoes. In 1989, for instance, creationist leader Ken Ham warned that “Most parents have left the training of their children to the church, school or college.” No wonder, Ham argued, that children embraced anti-God theologies. So when conservatives in 2013 warn that CCSS will undermine parental control, they draw on a rich tradition of conservative thought and activism. Schools must remain on a tight leash, many conservatives have insisted over the years. If allowed too much power, centralizing educational authorities will take over.